Lhasa, Tibet (China) -- When the grandfather and grandmother of Zhaxi Toinzhub died, they were treated to sky burial according to their own will. 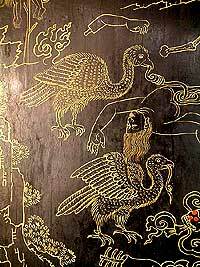 It is a traditional Tibetan burial where the bodies are left for vultures, creatures worshiped by the locals as sacred. About 80 percent of Tibetans choose sky burial, as has been observed for thousands of years, said Basang Wangdu, director of the Nationality Research Institute of the Tibetan Academy of Social Sciences. Tibet has 1,075 sky burial sites and about 100 people to conduct the rituals, according to figures from the regional civil affairs department. The largest sky burial site at Drigung Til Monastery receives about 10 bodies on an average every day. The rituals carried out at the 900-year-old monastery are regarded auspicious. The rituals are carried out by a special group of Tibetans, called sky burial operators. The 65-year-old Celha Qoisang was chief sky burial operator at Drigung Til Monastery. "I used to get totally exhausted every day, but I am willing to live like this because sky burial is an important part in Tibetan life," Celha Qoisnag said. He learned the techniques from his uncle and was engaged in the profession for about 10 years. He usually dealt with one to 20 bodies a day and could adroitly dissect, smash, and feed the bodies to the vultures within two to three hours. "I could only rest for one day every month, the 19th day each month in the Tibetan calendar. And I usually spent the day reading sutras and praying for the dead," he said. According to a Tibetan Buddhist sutra, the divine in heaven get together on the 19th day every month and the mundane are not allowed to kill or let the divine smell blood. Every night all the lamas would read sutras for the bodies, staying overnight at the monastery, said Samdain, head of the democratic management committee of the Drigung Til Monastery. The unique rituals are recognised by the central and regional governments. The regional government bans uninvited outsiders from participating in the rituals and photography is forbidden. These measures are for showing respect to the rituals and the dead.Sky burial is one of the three principal ways, through which the Tibetans traditionally return their dead to the earth. The two others are cremation and water burial. Sky burial is closely related with Buddhism worshipped in the Himalayan region. Buddhists believe life recycles and advocate kindness and charity. The spirit of the dead is believed to leave the body the moment he dies and the dead should be fed to hungry vultures as a last token of charity. Though the central government built a modern crematory in Tibet on Oct 17, 2000, it is not favoured by Tibetans. The first Tibetan cremation was carried out on Jan 2, 2001. Cremation is not popular among Tibetans due to thousands of years of tradition. Wood is so scarce in the mountainous areas of Tibet that in the past burning a corpse was reserved for people of stature. Tibetans could choose their own burial way and sky burial is still widespread in Tibet, said Cedain Lhunzhub, head of Xishan Crematory in Tibet. "In fact, burials are not that important after human beings' death, and we Tibetans prefer sky burial because it contains Tibetans' compassion and belief. I would certainly choose sky burial after my death, though I am not a Buddhist believer," said Zhaxi Toinzhub, a young Tibetan in his 20s. The Tibetans still carry on ancient rituals like sky burials, displaying a timeless adherence to the old ways of life and death, unaffected by the changes that are rapidly affecting the rest of China.